The SPINAL is mainly designed to protect the MPL industrial products from various input voltage failures. This includes reverse polarity, over voltage, load dump effects and brown out failures. A Load dump occurs mostly in vehicles and refers to what happens to the supply voltage when a load is removed rapidly. Such high voltages surges will be protected by the SPINAL. A Brown out occurs when the input voltage drops below the specified level. In this condition the SPINAL switches on the SuperCaps path in order to supply the power uninterrupted to the system. During normal operating conditions the SuperCaps will be recharged. The SPINAL informs the system about the state of the power supply via some handshake signals of a serial interface or by USB. The states "On Line", "On Battery" and "Battery Low" will be handled by the driver and an appropriate action will be executed. 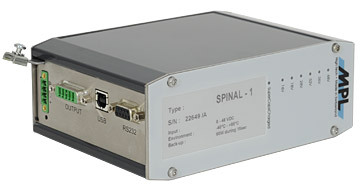 The SPINAL is designed to protect the system from short power supply brown outs. The time the SuperCaps supply the power to the system is long enough for shorts power supply failures and to do a clean system shut down. It is not the intention of the SPINAL to supply SuperCaps power for long time periods whereas the system is running as usual. 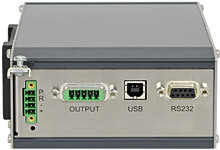 The solution is build into a DIN-Rail mountable housing. Flange mounting and OpenFrame versions are available too, or it can be installed into an extended PIP housing. Vin below 8V 12V from SuperCaps path "OffLine"
Vin between 8V and 12V 12V from SuperCaps path "OnLine"
Vin above Vnominal 12V from SuperCap path "OffLine"
The driver used for the SPINAL is the open source driver "apcupsd" (see www.apcupsd.com). This driver has the advantage of being highly configurable and is available for different operating systems. Linux: The driver "apcupsd" is available in all majors* distributions. Windows: The driver "winapcupsd" works with various Windows version*. It is available under www.apcupsd.com. * Tested so far is Windows XP and Windows 7 (apcupsd driver).